As oyster folk we needed a vigneron’s wisdom, gnarled hands, professional nose and innovative wine craft. 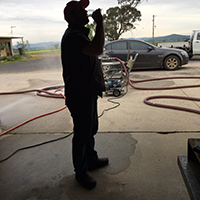 Luckily, just up the road from our grain farm we found some oysterholic collaborateurs at Windowrie Wines of Canowindra. Many platters of oyster later the chief strategist Jason O’Dea and winemaker Anthony D’Onise made the vision a reality. Windowrie constantly reinvents its own wine platform and pulled some big wins recently: Best Organic Wine ( Melbourne Wine show) and Best Shiraz of NSW (Sydney). And consistent with Moonlight Flat’s obsession with oyster care, Windowrie shares our values when it comes to our wine: hand-crafted care and organic values in all but the paperwork. Jason sums up the challenge as working with the unknown. “We scratched our head with the big berries and heavy bunches. Working with a clean slate of a new variety presented a great challenge that doesn’t come along often in a lifetime. We’ll keep tuning as we go through the seasons, maybe lighten the load a bit and chase greater flavour levels. However, it certainly lives up to its reputation as the default wine for oysters”. “My biggest challenge was to understand the wine style. Steve provided examples of the two main French styles and shepherded us towards his preferred fresh yet full-bodied style as opposed to the downright cheap and cheerful model. It took a few taste trials and many Moonlight Flat oysters but I think we got there comfortably. There was simply no Australian benchmark but my experience in Europe helped in working with high acid levels in the grape. These special clones produced an amazing match with his seafood, we’ve read all the reviews which are pretty undeniable. There’s nothing like this for Aussie seafood”.